To better understand the ways energypedia is used by the energypedia community as well as to know their level of satisfaction, we recently conducted our first energypedia user survey. The survey was launched on 30th June 2015 and closed on 13th July 2015. A survey link was included on our website, sent via emails to all our registered users as well as spread via our communication channels such as newsletter, Facebook, Twitter and LinkedIn. What is the energypedia user demographics? How and for what purposes do people use energypedia? What impact does energypedia have in their work? What is their level of satisfaction with energypedia? What motivates the users to get actively involved in the energypedia community? A total of 185 people took part in the survey and gave us their valuable feedback. To better understand the usage of energypedia, we divided our respondents into two groups namely: registered users having an energypedia user account and non-registered users who do not have an energypedia user account. There were no significant differences between the answers of these two groups except in their visit frequency on energypedia which is highlighted in the section below. 86.9% (120 respondents) are either very satisfied or satisfied with energypedia's overall services. 11.6% (16 respondents) are slightly satisfied while 1.4% (2 respondents) are not at all satisfied. 58.9% (83 respondents ) have also recommended energypedia to other people. Out of the total 185 respondents, 146 already have an energypedia user account. 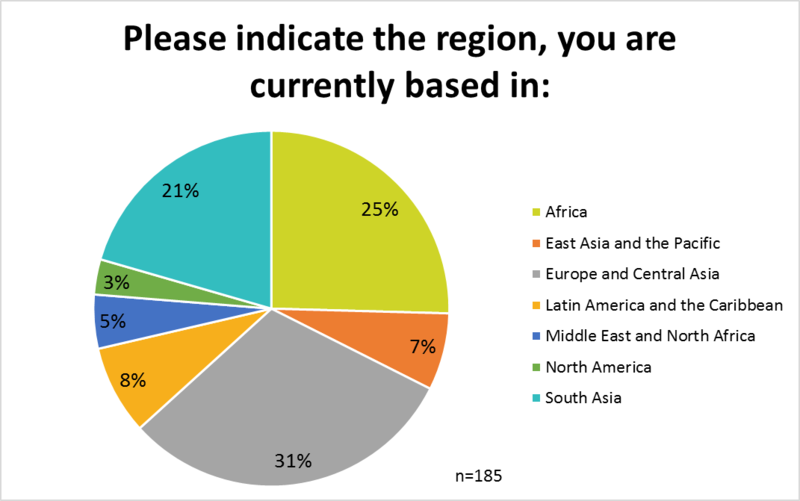 Most respondents are located in Europe and Central Asia followed by Africa. They also work mainly in the private sector, followed by the government sector and the non profit sector. 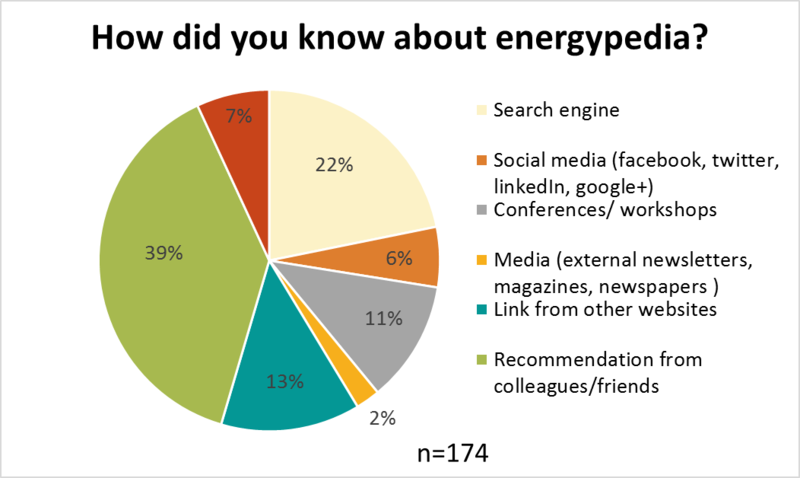 According to the survey, most of our respondents came to know about energypedia via the recommendation of their friends/colleagues and mostly use energypedia to update themselves about the latest developments in renewable energy. 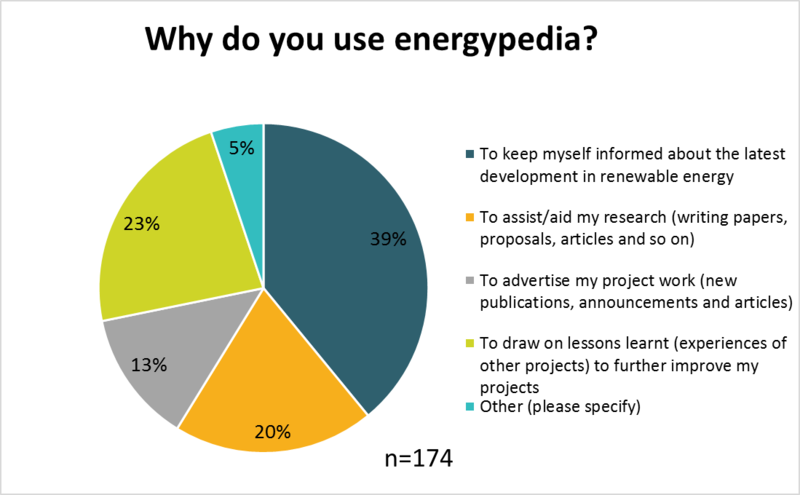 However, almost one quarter of all respondents also use energypedia to draw on lessons learnt for improving their own projects and one fifth use energypedia for writing papers, proposals, articles and so on. Most of our registered respondents visit energypedia every week or at least once a month while most of our non-registered respondents visit energypedia only once in a month or a few times per year. 28% (40 respondents ) of the total respondents said that they have at least once written or edited an article on energypedia while 43% (61 respondents ) said that they did not know how to do it. Sharing information about renewable energy is one of the biggest motivations of most of the respondents. The respondents would contribute if they had a better idea about what kind of information is in demand and if the information they will contribute will be beneficial or not. 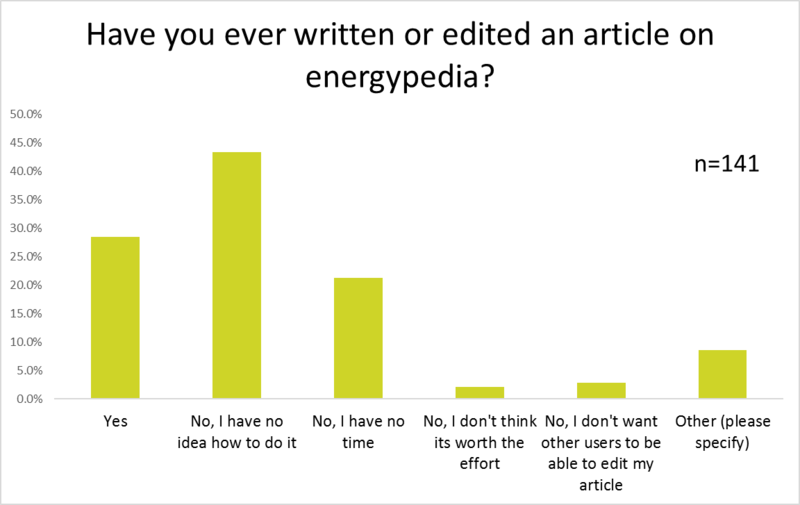 A clear picture about the user traffic as well as the ease of working on energypedia would also motivate respondents. For some respondents, they would only contribute if it was part of their job requirement. According to the survey, the respondents were mostly familiar with the solar portal and the RE/EE Project Resource Center and were mostly unfamiliar with or could not rate the Fuel Price Database and the Transport Portal. 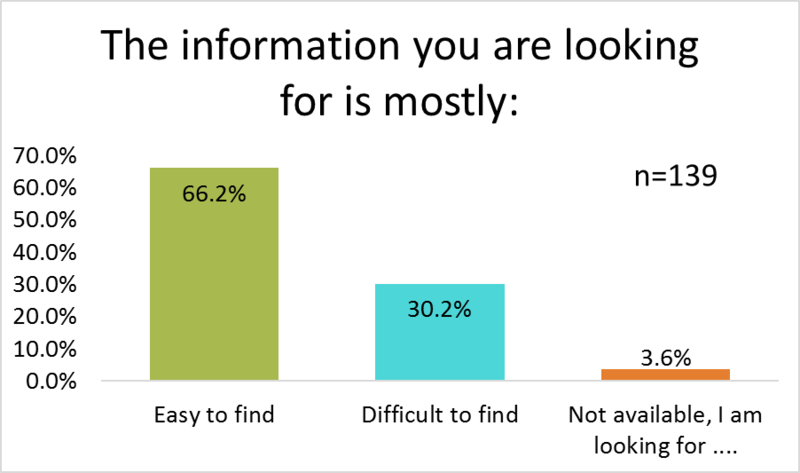 Most of the respondents said that it is easy to find what they are looking for on energypedia. 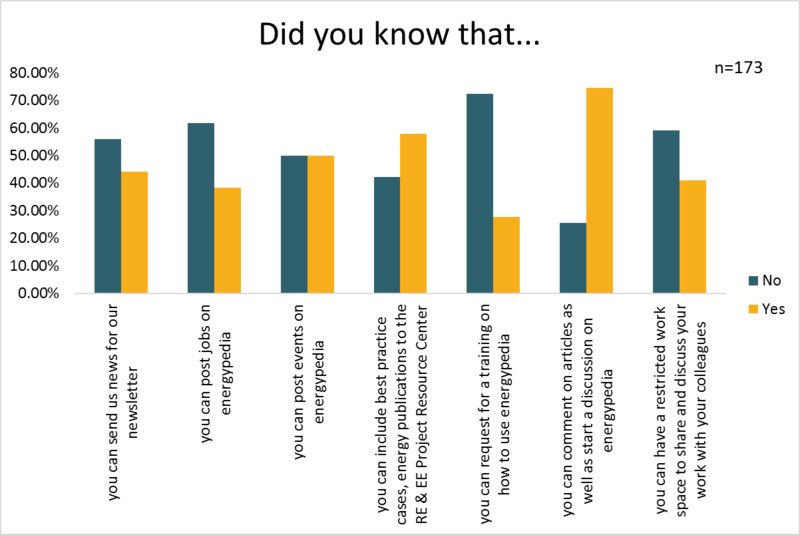 Most of the respondents were unaware of different features of energypedia like posting jobs, requesting training, sending news for the newsletter and so on. Most of the respondents were unaware that they could directly contact other users via the energypedia platform. Out of the total 185 respondents, 138 have subscribed to our monthly newsletter. Most of our subscribers read the newsletter every month and find the newsletter interesting. Most of our respondents are satisfied with the current energypedia newsletter and have nothing to add. Some suggested us to include more new publications, as well as events in the renewable energy sector. Some requested for announcements on online courses as well as call for proposals. We also got suggestions for a theme based newsletter with better design and a better feedback loop. 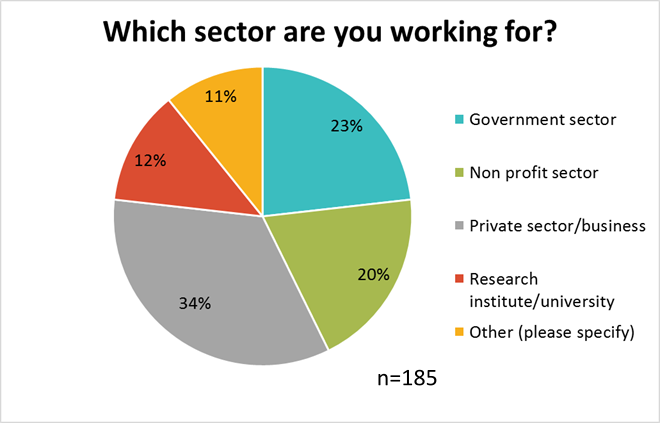 Most of the survey respondents have either never donated to energypedia or did not know that energypedia needs donations. This survey has provided us with some valuable insights about the energypedia community as well as their usage of energypedia. 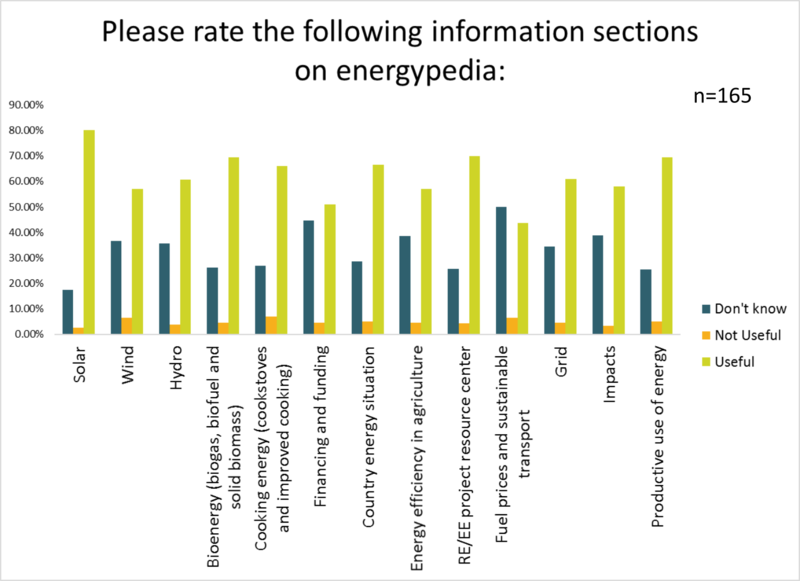 According to the survey, most of our respondents are satisfied with energypedia and regularly use energypedia to keep themselves updated about renewable energy topics. However, we also learnt that most of our respondents are not familiar with many of our features like adding jobs, writing articles and so on. In addition, we also received some constructive feedback on further improving our platform. We will take into consideration all the suggestions mentioned in this survey and will incooperate them whenever possible in our future strategies. The results of our user survey 2017 can be found here. This page was last modified on 4 December 2018, at 17:28.